Suggested Usage: As a dietary supplement, take 1 VcapÂ® daily preferably with meals. Contains no:Â sugar, salt, starch, yeast, wheat, gluten, soy, milk, egg, shellfish or preservatives. 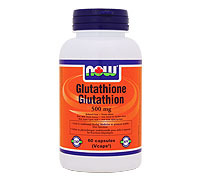 Our Glutathione is a high potency material manufactured to rigorous standards.Â The term "reduced" refers to the non-oxidized stable form of Glutathione. VcapsÂ® is a registered trademark ofÂ Capsugel.